Mall Floyd was a wicked woman who developed an unpleasant line in criminal activity. She would steal or kidnap children, take them somewhere far from their parents or guardians and then relieve them of their clothes and valuables. They’d then be left to fend for themselves as best they could. In 1674, Mall Floyd found a girl of about eight years of age in Shoe Street. I may be wrong but I think Shoe Street now corresponds to what’s called Shoe Lane in Farringdon. In the seventeenth century, that thoroughfare would have been just outside the ancient city walls. The road ran parallel to the Fleet River, which is now hidden away in a sewer. It was there then that Mall Floyd chanced upon this refined girl who looked very finely dressed. Our thief figured the girl’s clothes would make a pretty penny or two. Approaching the eight year old, she claimed to be from her mother and then carried off the child as far as St Giles. That was a pretty run down village where Centre Point stands, at the top of Tottenham Court Road. The parish church of St Giles is still there behind Centre Point. St Giles was a notorious slum that contributed a great number of villains to the hanging tree at nearby Tyburn. So, Mall Floyd took the child to an ale house and seeing that it was about to rain, suggested that the girl should remove her expensive laces and linens as they would be spoilt. Now with her hands on the goodies, Mall Floyd took the girl to the churchyard of St Giles. Luckily for our villain, there was a burial going on with a big crowd. Without a second thought, Mall Floyd simply dumped the girl in the crowd and melted away. The distressed kid burst into tears and a charitable individual took pity and very gallantly escorted her back to the house of her parents. The girl recounted everything that had happened – the women claiming to be a friend of her mothers, taking her to a pub, removing her pricey garments and then disappearing. The family were furious but what could they do? Then a remarkable thing happened. The child’s mother was walking through Holborn when she saw her daughter’s lost clothes hanging up for sale in a shop window. She raised hell with the shopkeeper and after some investigating – there were no police in those days remember – the family found the culprit. Mall Floyd was dragged before the courts. Incredibly, she confessed everything and was sent to Newgate prison. 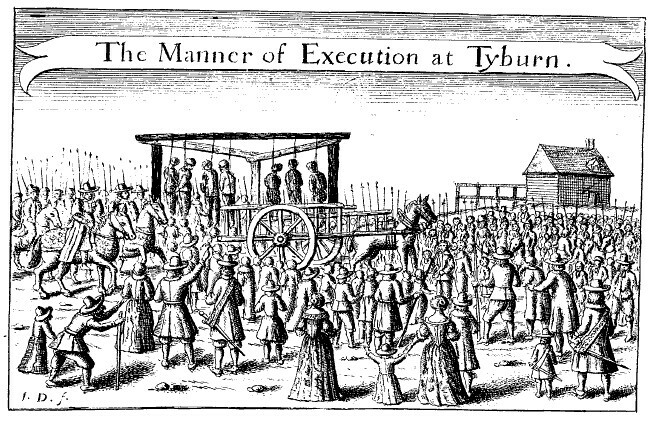 When she returned for sentencing, Mall Floyd might have expected to dangle from a rope for the amusement of the crowd at Tyburn. Instead, she was “transported to some of the plantations beyond the seas”. Most likely the Americas where Mall Floyd, if she survived the journey, undoubtedly breathed her last. Previous Post American “lunatic” shames the British into reform! Next Post Who was the notorious London Monster?